Malaysia is one of the countries which takes their tourism industry seriously, A consequence of this is a blooming tourist industry where tourists spent a total of MYR 83.1 billion (USD 19 billion) in 2016 . Malaysia also have fairly easy visa process for its tourists . Passport holders of India, Sri Lanka, Bangladesh, China etc can now get Malaysia eVisa online. This move has been welcomed by many tourists and millions of tourists have made use of this service. We alone had processed around 60,000 Malaysia eVisa in 2016. In fact, we have had many Indians choosing to visit Malaysia instead of Singapore simply because it was easier to get Malaysia tourist visa online. The easiest Malaysia online visa you can get for tourism purpose is called Malaysia eNTRI visa . You can visit Malaysia for 15 days with eNTRI visa. What is the difference between Malaysia eVisas ? This article we will be only discussing about the one eVISA options that we have. Note that we are not talking about eNTRI here. If you are travel plan is to stay in Malaysia for more than 13 days, then to be on the safer side we always suggest our customers to take the 30 day visa. What does Malaysia eVisa cost ? 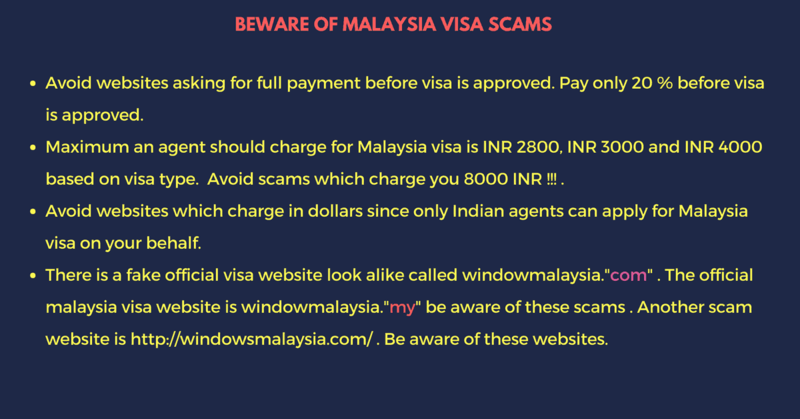 Although, Malaysian government had waived off the fee for Malaysian eVisa, the VFS website still charges fee for every visa that is processed. Below is the actual cost of eNTRI visa when we are about the make the payment to the VFS. Below is what we charge our customers including our visa processing fee and GST of 18%. Which is the eVisa service for Malaysia ? Once you fill the form, you will receive an email we will contact you and gather your details . You will get your visa soon. What is Malaysia eVisa ? Malaysia eVisa is an online document which acknowledges that you have been given permission to visit Malaysia for a period of 30 days as a tourist .During this period, you cannot engage in any kind of employment . Visa is valid for 3 months only. You must visit Malaysia within 3 months of your visa being issued. eVisa can be used for multiple entry. 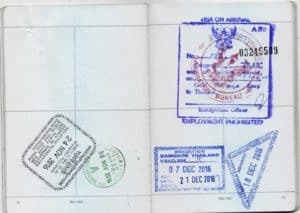 Once you exit Malaysia, you can enter Malaysia again using the same eVisa document. You need not apply for another Malaysia eVisa if you wish to enter Malaysia within the next 3 months. You can stay in Malaysia for a period of 30 days only. 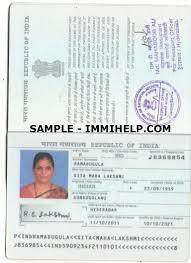 The requirements for both visas are the same for Indian citizens. You need passport with validity of at least 6 months and at least 2 empty pages for both exit and entry stamps. Malaysia visa requires that you have a scanned photograph of the applicant. This image must be 35mm X50 mm width. Ask your local photo studio to get the scanned image as per specifications. 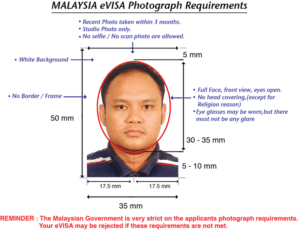 If you are applying for Malaysia eVisa or eNTRI from us, then we will use our graphic designers to ensure that the photo is of the right specifications. But even we will need your photo as close to the specification as possible. Malaysia visa photo requirement needs you to upload an image which is of either png or jpg format. The maximum size allowed for your photo is 2 MB. If you are applying through us we will make sure of this as well. Majority of Malaysia visa rejections happens because of the photo specifications. So don’t take the risk and consult the professional of the same. Scanned copy of your passport’s first page. If you have 2 passports, one which is expired or old, you need to have a scanned copy of your latest passport’s first page. This page needs to be of png or jpg format and be under 2 MB size. Below is a sample of how your scanned copy should look after you scan. Scanned copy of your last page. The requirement for this is the same as above. 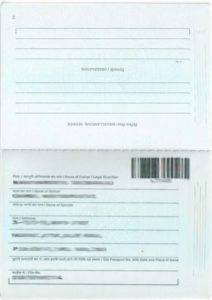 If you have travelled before, you need to upload a scanned copy of page with your most recent return trip stamp. Confirmed flight booking with dates entering and exiting Malaysia(if you are applying for Malaysia visa through us, then we will arrange this document for you) . This document needs to be pdf format. We will take care of getting your flight ticket for the dates that you give us using our travel agent systems. So you are under no risk of losing your money if your visa is cancelled or your plans change. We are in fact your safety net against losing your money before your visa is approved or your travel dates are changed. Confirmed proof of accommodation for the entire duration of stay (if you are applying for Malaysia visa through us, then we will arrange this document for you). This document must be presented in pdf format. Again, we will use our travel agency connections to get you a proof of accommodation for the entire duration of stay, and use that to apply for your eVisa. Once your visa is granted, you can make your own bookings just be on the safer side of things. Who can apply for Malaysia eVisa ? s, Please see the below image. Can I apply my eVISA in Malaysia ? eVISA is vaild for 3 months while eVISA holder is entitled to stay up to a maximum of 30 days for each visit in Malaysia. Each application can only be used once and no extension is allowed.